At the December 7, 2015 City Council meeting, the Park Sales Tax implementation plan was approved by the City Council. This plan creates the schedule of approved park improvements and new park development over the next six years. The projects are selected and placed within a given year based on a number of different reasons including construction schedules, necessary safety improvements, planning schedules, grant opportunities and the ability to reduce utility expenses or maintenance costs. The Parks and Recreation Department will hold interested parties meetings and ask for Council approval for each project during that project's funding year, but we would also like to use this forum to gain overall input about each proposed project. For each project, you will see a short description of the general improvements proposed by the park planning staff, and we would like additional comments from the public about each park and trail project. This forum allows the public to provide input for each project ranging from a new idea for that park or trail or point out an area we should focus on as we renovate or construct the park. In the forum, you will see many different ideas that represent each of the park and trail projects in the PST implementation plan from 2016 to 2021. Please feel free to comment within each idea about what you would like to see! You can also add a general idea to the forum if you have an idea for a trail or park that isn't listed as a current idea! Thank you for your support of the 1/8 cent Park Sales Tax and we look forward to the numerous park and trail improvements and development over the next six years. Improvements to Gans Creek Recreation Area (GCRA) will focus on the construction of a concession and restroom facility to service the seven multi-purpose athletic fields currently under construction as part of the 2010 Park Sales Tax. The regional park will serve as one of two main locations for all soccer, football and lacrosse leagues and tournaments as well as special events and unique sports tournaments such as archery and ultimate frisbee. The facility is needed to provide the necessary amenities for all of these events. Park staff will manage the concession operations within the facility. Total funding for the project is $600,000 with construction scheduled to begin in 2016. 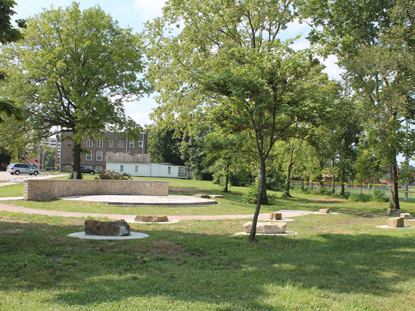 In 2015, park staff completed phase I improvements associated with the Douglass Park Master Plan approved by the City Council in 2014. Improvements included new parking on 5th street, an outdoor amphitheater, small shelter and increased green space in the park. As part of the Council approval process, the Council recommended phase II improvements occur immediately after the passing of the 2015 Park Sales Tax. Phase II improvements of the park, with total funding of $225,000, will take place during summer 2016 and include the construction of a new medium-sized shelter, skate spot, playground replacement, walkway improvements and lighting improvements. 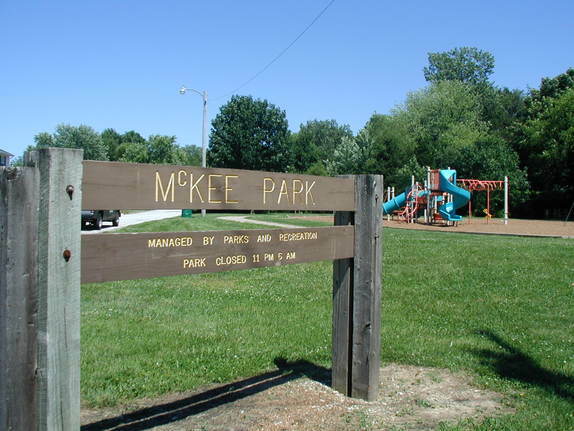 As one of the first projects to be completed in the PST implementation plan, improvements to McKee Street Park will include the replacement of the existing playground equipment, replacement of the walking bridge in the park, honeysuckle removal and an overlay of the basketball court. Total project funding is $75,000. 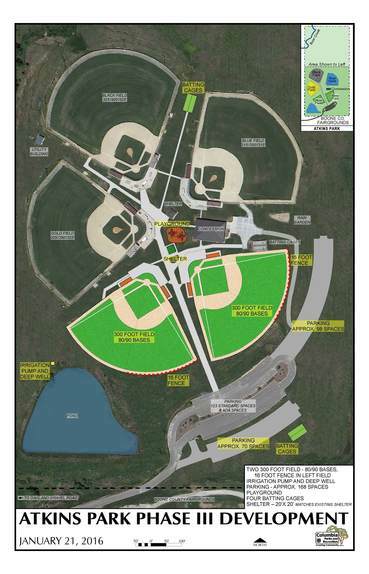 Atkins Baseball Complex Phase III Improvements will be completed in 2016 and include the construction of the final two baseball fields including grass infields, regulation mound and sports field lighting. The 310' fields will be able to accommodate 90' and 80' and will include 12' fence heights in left field. Additional improvements to the complex will include parking additions, a small shelter, playground, walkways, a playground and lighting. Improvements to the park will take place in 2016 and include a new medium-sized shelter, small lakeside shelter, playground, additional parking, walkways and lighting. It would be great if we could get the RC track at cosmo handicap accessible. A pavilion would be great to shield people from the sun. A driver stand would make the track more usable. Also in order to keep the track maintained we need water ran to the track. It would also make the track easier to maintain if either parks and recreation would allow us to use some equipment on it, or if they would use their equipment on it with members of our group present to advise on the maintenance of the track. These things would greatly improve the usability of the track. Staff is proposing to construct the first phase of the Perche Creek Trail from the MKT Trail to Chapel Hill Road. When the entire trail is completed, it will connect citizens from Cosmo Park on the northern edge of Columbia with the MKT Trail and Katy Trail. The first phase of construction of the 1 mile concrete trail will begin at the MKT Trail and end at the Chapel Hill Connector. Staff will need to install two bridges along this section of trail to cross the Perche Creek. Planning for the project will begin in 2018 with construction scheduled to begin in 2019. The total project funding for the trail and connector to Chapel Hill is $1.7 million dollars and staff anticipates applying for additional grant funding through the Missouri Department of Natural Resources Recreational Trails Program Grant and the Land and Water Conservation Fund (LWCF). 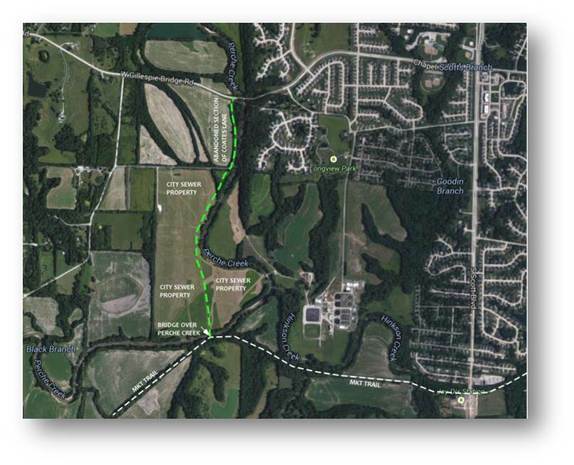 Staff is proposing to construct a significant portion of the Hinkson Creek Trail from Stephens Lake Park connecting to Clark Lane. 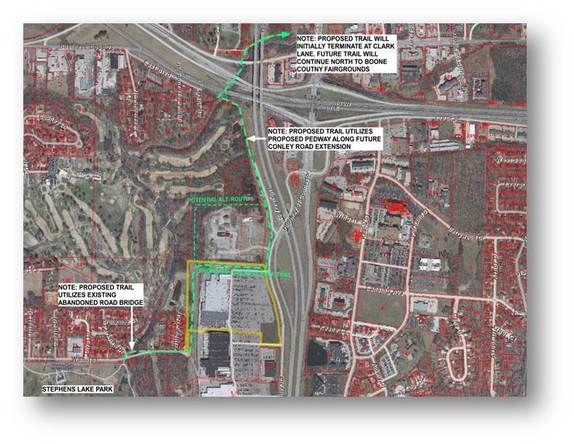 The construction of this trail section will link citizens north of I-70 with Stephens Lake Park, the downtown and the University of Missouri. The Parks and Recreation Department will work with GetAbout Columbia on the project as the funding for the portion of the trail under I-70 is part of the GetAbout Columbia grant. Staff will use the existing bridge on Walnut Street for the creek crossing and anticipates a concrete surface for the trail. The total project funding is $950,000 with planning and construction set to begin in 2020. The City of Columbia currently owns and operates three indoor basketball courts for use by the public. Two of the basketball courts are located at the ARC and one at the Armory. The two courts at the ARC are only used by ARC members and daily pass attendees. 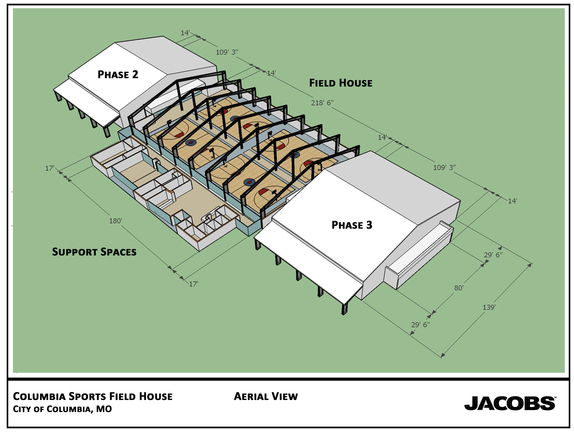 In an effort to increase the available space for indoor sports leagues and tournaments, park staff is proposing to build an 8-court indoor fieldhouse at Philips Park on the northeast corner of the property. With 2015 Park Sales Tax funding, staff is proposing to build the first four courts and support facilities with the additional four courts being constructed at a later date with additional funding. The courts will be designed to accommodate basketball, volleyball, pickleball and other potential indoor sports throughout the year. Staff anticipates this facility will attract nationwide sports tournaments such as AAU basketball and indoor pickleball events. The total project funding is $2,700,000 with additional potential funding provided by the Columbia Youth Basketball Association and the Columbia Visitors and Convention Bureau. Staff anticipates the planning of the facility to begin in 2016 with construction scheduled to begin in 2017. Park staff has allocated $75,000 for the development of the park which will be located between the El Chaparral and Vineyards neighborhoods. 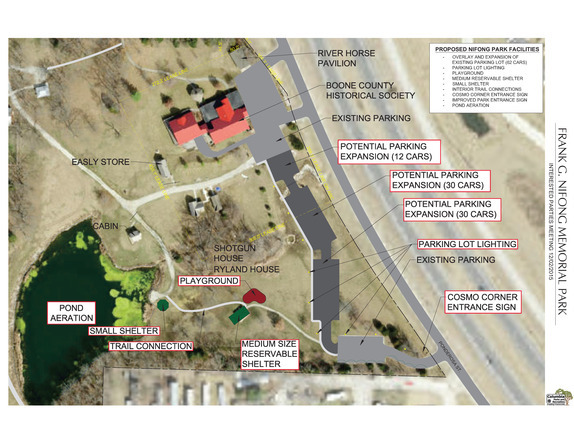 Initial development of the park will take place in 2021 and include the installation of a walking trail around the 10+ acre lake on the property and accessible parking with lighting on the west side of the lake.